Details on each of these people can be found on Ancestry.com - if you do not have a subscription, you can access Ancestry for FREE at most local libraries in the United States. 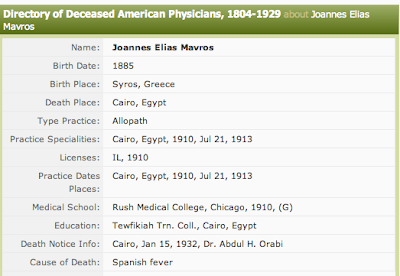 "This data set contains biographical information on approximately 149,000 medical practitioners extracted from the esteemed two-volume set titled "Directory of Deceased American Physicians" edited by Arthur W. Hafner. The "Directory" was produced from a card file created by the American Medical Association. The great variety of information included here will provide valuable clues to help you further your research. The information is biographical in nature and includes extensive details on education and practice specialties. By learning where your ancestor set up his or her practice, for example, you can get a general idea of where he or she lived. With information on the type of medicine your ancestor specialized in, you may wish to research medical journals of the day to see if he or she published any research. More fundamentally, the dates and locations of births and deaths may provide the clues necessary to locate vital records. 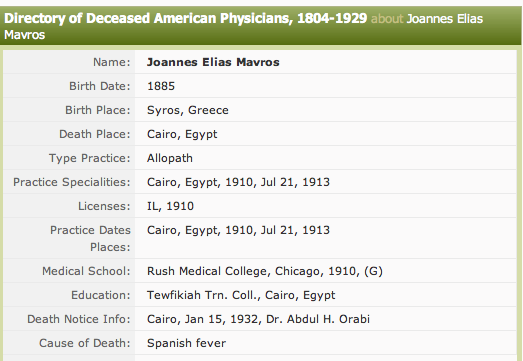 While each record varies depending on the type of information submitted by the practitioner, generally for each individual this index lists their full name, cause of death, death date, place of death, birth date, birthplace, type of practice, practice specialties, board specialties, states and years of licenses, places and dates of practices, hospital affiliations, medical school attended, other education, professorship (if any), and reference to death notice in the Journal of the American Medical Association. In 1905, at the annual meeting of the American Medical Association in Portland, Oregon, the House of Delegates proposed the compilation of a directory of medical practitioners. Until this time, the only national medical directories published were those in which a physician could, on payment of a small fee or by purchasing the directory, have information printed about himself or herself. Since the information submitted to these directories was not always verified, the directories were not necessarily accurate. 1) It would be a directory of the American medical profession, published and owned by the physicians themselves. 2) Information regarding college and year of graduation and date of licensure and society membership would be verified from official sources. 3) The directory would furnish the same information regarding each physician whether a subscriber to the directory or not. The directory would contain the names of all members in good standing of the constituent state associations and would indicate whether an individual was a member of the American Medical Association. No information was to be inserted for pay. To collect information for the directory, the American Medical Association initiated a formal program for gathering information on 4" x 6" cards. The use of cards was discontinued in 1969 when the Association began to use computers to store the information. The information from the 4" x 6" cards was compiled in a database known as the "AMA Deceased Physician Masterfile Database" and has been reproduced on this data set."